I'm the first person to tell you that Nestle is some of my least favorite chocolate on the market. 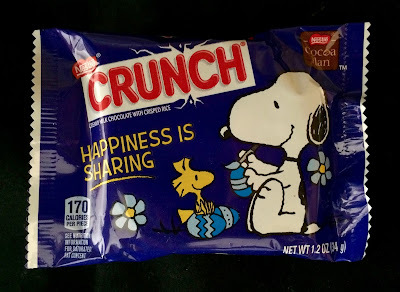 That said, I am in love with these Nestle Crunch Snoopy Easter Disks! 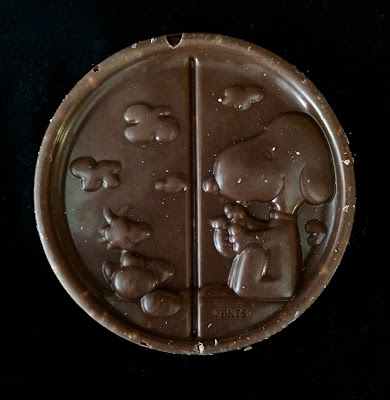 The tableau of Snoopy and Woodstock sharing Easter Eggs with clouds in the sky above is so pleasing and unique. What other mass-produced chocolate products depict whimsical landscapes? The milk chocolate with rice krispies even tasted better to me in this format.